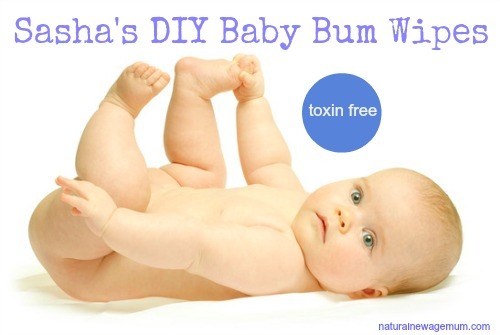 We had a great discussion in our Natural New Age Mum’s Facebook chat group the other day and gorgeous mumma Sasha shared her DIY baby bum wipes recipe. With her kind permission, I am sharing it on the blog so you all have it as a reference. So why would you DIY? Well, apart from the obvious money saving benefits, these wipes are eco friendly and contain no nasty additives or harmful chemicals that will go into your baby’s bloodstream. You don’t even have to use them on baby’s bums. We all know baby wipes are so handy for kids and big kids for all occasions! Lavender is a safe essential oil for babies, however many essential oils should be used with caution around babies. Please check before using any essential oil on babies and toddlers. This post is a good reference. Of course, using high quality oils is also recommended. Lavender is an anti-bacterial oil and it is also relaxing and soothing – perfect for nappy change time! Cut the paper towel in half so it looks like two toilet rolls. Put one roll in a container that you can seal up and it fits snugly. Mix together the water, coconut oil and essential oils. While still warm, pour it over the top of the paper towel and remove the cardboard roll in the middle. Seal up the container and you are ready to use them! Store out of reach of children. Do you make your own wipes? Would you give this a go? Brilliant! I’ve seen this before and Mums raved about it. I guess you’d try and find some super soft and safe paper towel 🙂 There’s nothing better than DIY and eco friendly combined! I think it would be even better with home made fabric wipes! Yes Liz, they would be great too! I make mine with bamboo nappy liners and a squirt of organic baby wash. However sometimes they go mouldy, do you find the straight lavender oil helps? what sort of container could you use..any ideas? I’m thinking of reusing a Greek yoghurt bucket for this. I think it’s about the right size.